In addition to the typical muted solid colors, I’m interested in some brightly colored D-Ring or cloth belts with stripes (think Brooks Brothers or Nantucket). I’m struggling to find the brighter, patterned belts for a decent price. Any help? Striped Belts are one of those trends that have been a trend for so long they’re now a Trend with a capital “T”. They’ve sustained themselves for longer than a fad, will surely fall out of favor w/ the masses at some point, and will then return a few years later on down the road. They’re the Kurt Warner of men’s summer accessories. Or, something. Know that playing a bright belt requires a certain amount of restraint with the rest of your getup. The brighter the stripes, the more subdued everywhere else. And unless they’ve got rivets, they might not hold their torque throughout the day. But they’re still unconventionally awesome. Kinda like that Super Bowl winning Quarterback who’s also in the Iowa Barnstormer’s Hall of Fame. Inexpensive, but shipping is a pain. Slimmer than most belts that pulls off loud by way of standard colors. This one would blend in if the colors were reversed with the blue as the base. But since it’s got the off-white as the background… it jumps. Try it with jeans, a navy cotton blazer, brown suede shoes, and a pale blue shirt. It’s a lot of blue, but it’ll work. Teenager Store? Yeah. But this appears (appears) to be almost completely logo free. You can get away with the very tiny “AE” stamps on the buckles. Haven’t seen this in person, so if anyone has and knows for sure if it’s got other branding on it, let us know in the comments. What you don’t want is this. Eeesh. No stripes, but the leather, silver grommets, and the ever present Lacoste Croc provide plenty of contrast. $39.00 through Bluefly but the sizes are almost all gone. $65 at Nordstrom which ain’t cheap. No uniform stripes here, just a real nice Madras plaid. The rope texture should help with some grip. Wear it with Grey Khakis and a white button up. More of a dressed up number thanks to the thin buckle, but with those leather ends it’s guaranteed to hold. Who knew you could combine a scout-style plaque buckle with a subtle green and blue striped webbing? Apparently the folks at Fred Perry did. Not for everyone, but still nicely done. Earth tones. Not a bad match for a blue sport coat. Looks like BR got the scout-style plaque web belt memo too. Also available in an off white and navy. Wait for a sale or buy some socks to get over the $50 and it’ll ship free. Extremely limited thanks to the color. Wear it with a navy blazer and you’ll look like you can’t wait to sit front row at a Lee Greenwood concert. Try it with honey colored chinos and maybe a white polo instead. Not the kid next door's belt. As grown up as stripes get and probably too stiff for most. Almost as much leather as white, baby blue, and sky blue stripes. Back side is all leather. Thinner metal at the buckle. Looks like it’d be perfect with almost white pants and a black polo on the golf course… if you’re in shape. As preppy as it gets, but since they’re just flags with the Brooks Brothers 1818 date on em’, it steers clear from that kiddie feeling. The Dunning Prep Tie Belt has been further reduced to $5.21. Surprised you didn’t mention the ones at Land’s End (not Canvas), which are $29.50 and add the 25% off sale that’s going on. I have the AE belt and it is relatively free of branding. The small logos on the buckles are barely noticeable. It is pretty wide however, and has some small fraying on it. Any kind you like… its like wearing white sneakers. My thoughts would say a light brown would pick up on the clay colored bottoms easiest though. Use: AVPMAY1 and Get 20% off your order. Expires May 18, 2011. Snap! Nice! Updated, credit given. Man those are dirt cheap. HDU11 for free shipping works better. Total is 5.21 shipped vs. 10.12. That Lacoste belt has been at TXMaxx and Marshalls in the Pacific Northwest for a few weeks now for only $20 or $25 (forget which). I’ve seen both blue and white. Also, the gator logo is only held on by a few stitches so should be easy to remove. That American Eagle Orange and Navy would fit right in at Auburn. Therefore, I cannot support it. Double nice. Well done, updated..
As long as we’re on the topic of belts, I’ve been wondering something. I picked up a pair of bostonian gray bucks. I would describe the gray as a sort of pewter-ish shade. What sort of belt would I wear with them? You can get plaque belts for, like, three dollars at any Army/Navy store. Bought 3 different tie belts. I got the last black one so hopefully it will ship. And, now, to piss you off….Go Gators. For the larger guys they have 2 Madras-print D-ring belts for about $13. After the 25% discount it comes in under $10 (not including shipping). I have the AE one as well (actually wore that one in the pic today with an orange gingham shirt, dark jeans, brown suede sperry loafers, and the AE watch Joe reviewed earlier. I actually purchased all of the AE belts, when they were having a 30% off clearance, and found a code on slickdeals for another 20% off of that. great, durable belts from what I can see. I live in Kansas City and I can back up Doc’s comments on the lacoste belt. I’ve seen them at both Marshalls and TJ Maxx for $19.99. Damn, why can’t they have any smaller sizes. 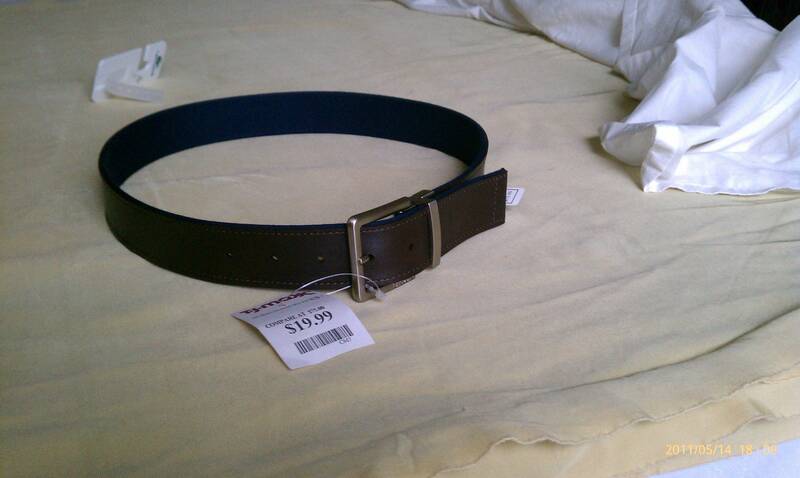 I really need a medium, but I’m tempted to try out the large just because its a nice belt for the price. 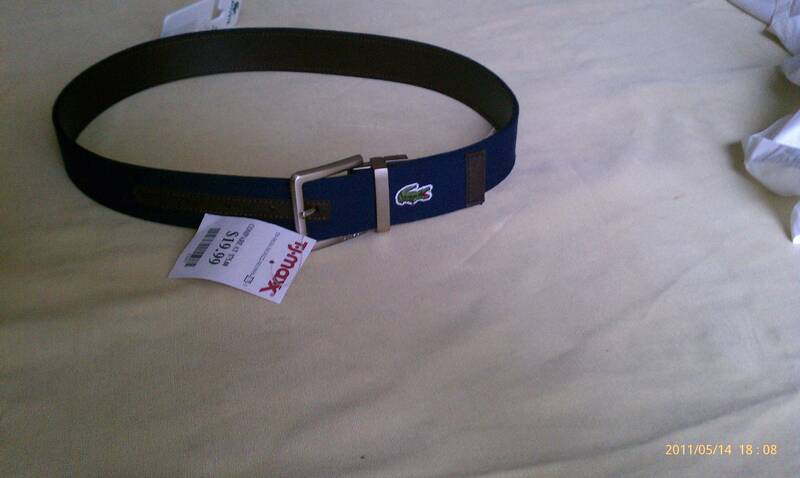 If there is a Nordstrom Rack near you, look for the Lacoste belt. I think they’ve just moved the shipment, and I picked mine up for 12.50. They had plenty of sizes too. The Lacoste and the J. Crew, I dig, but the others require a braver man than I. The Rugby Madras and Rope Belt, makes me think of Uggs for men…wearing shorts…with knee socks. I’m wearing that Lacoste belt right now. Got it at Marshall’s for $12. I find a lot of what you could expect to find at Macy’s at Marshall’s for half the price. American Eagle has free shipping today only, with 15% off code 49204021.